Homepage. This page: Need a hankerchief? see these classic hankerchiefs issued by Disney in 1965. Anyone remember having these road safety hankies when they were a child? I certainly don't remember seeing them, although these hankies from 1965 pre-date me somewhat. Amazingly they've never been used, and are still in their original Disney box. 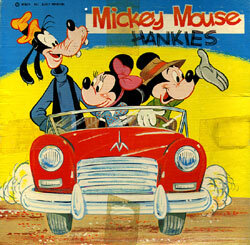 The box lid shows a red convertible being driven by Mickey Mouse, with Minnie and Goofy coming along for the ride. The box is dated MCMXLV, but each hanky actually has MCMLXV on it, which I think is the correct date (1965). 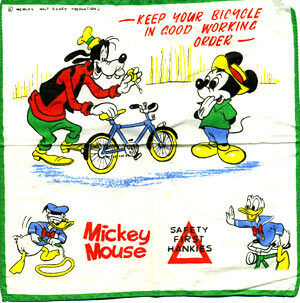 The first Mickey Mouse Safety First Hanky shows Goofy fixing up Mickey's bicycle, with the advice to 'keep your bicycle in good working order'. Underneath is Donald Duck pumping up a tyre innertube, and then riding along on his bike. 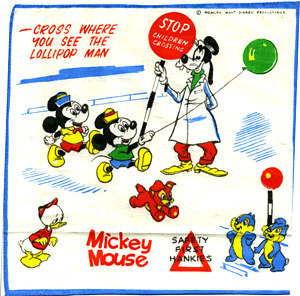 The second Disney hankerchief shows Mickey and Minnie using the lollipop man to safely cross the road. The illustrations look accurate for British children, although the car on the box lid is lefthand drive, so was this a UK-only production or available worldwide? Having been folded for many years (40+) they weren't the easiest things to scan..
Return to the car collectables page for more oddball & unusual items relating to old cars and the history of driving.